Hi everyone! I’m sure many of you are busy decorating for the holidays or trying to get your shopping done. It’s such a busy season, but there is also something special and magical about the hustle and bustle of the holidays! 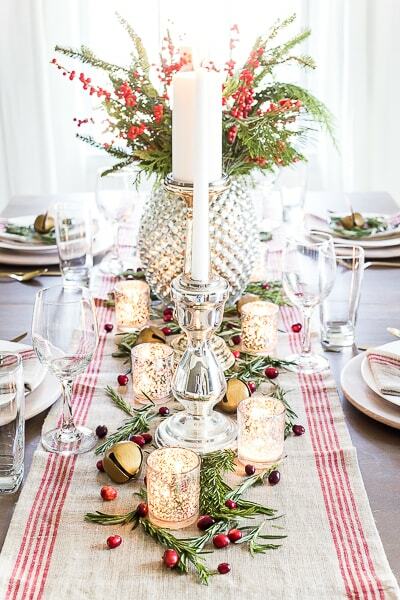 For some of you, along with shopping, wrapping and decorating, you’ll also be hosting some kind of gathering as well. 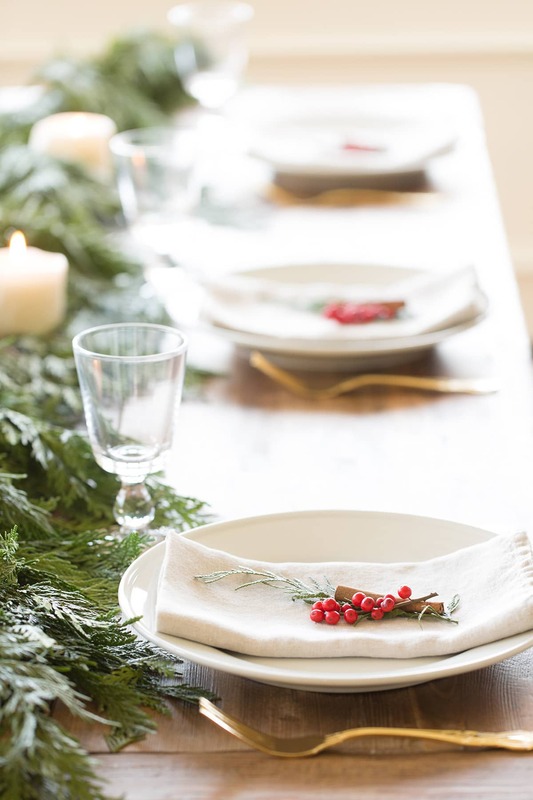 Whether it be Christmas Eve dinner, a fun dinner party for friends, or even New Year’s Eve, you may be looking for tablescape ideas. If so, this week of inspiration is the one for you! 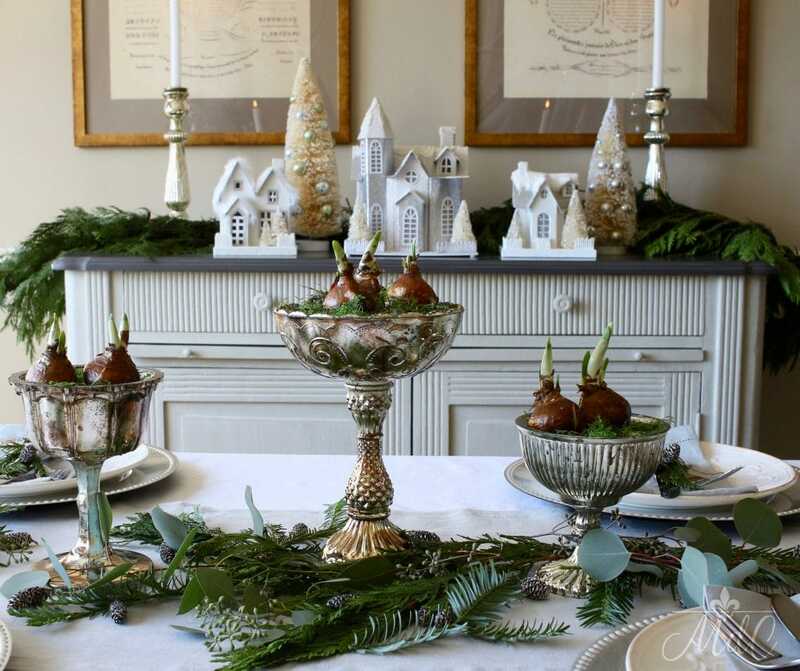 I’m joining the Styled + Set Holiday Entertaining Blog Tour, hosted by Lory of Designthusiasm. 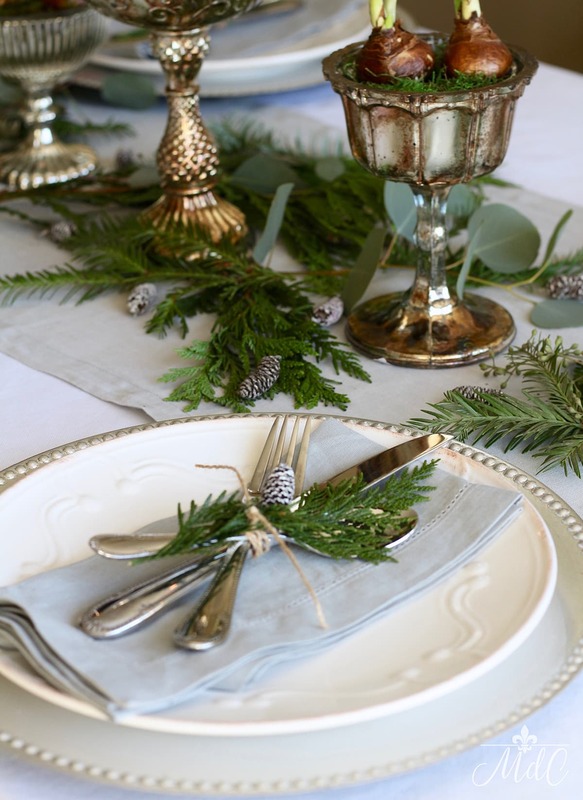 Today I’m sharing my Christmas Tablescape along with six other bloggers. But there are a total of 25 tables and entertaining ideas being shared throughout this week, so be sure to check back and take a look. I know you’ll find lots of gorgeous inspiration! 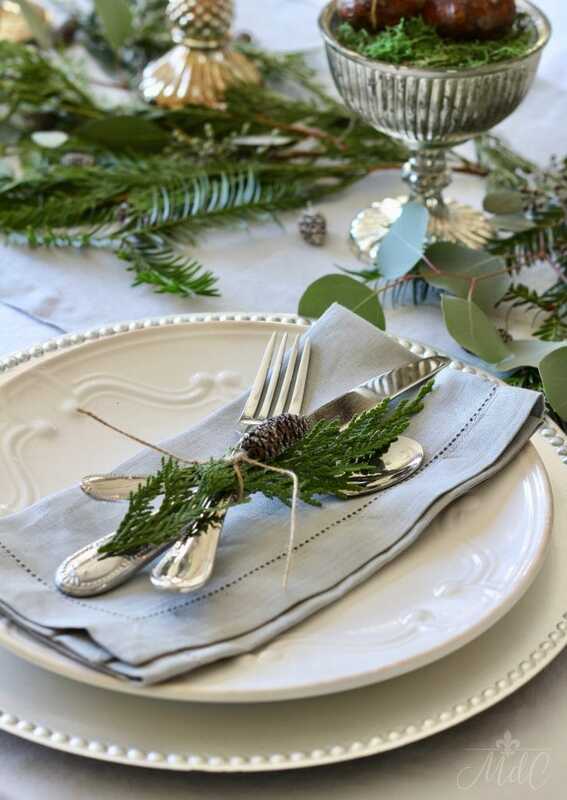 You can also find lots more table settings in my free e-book! 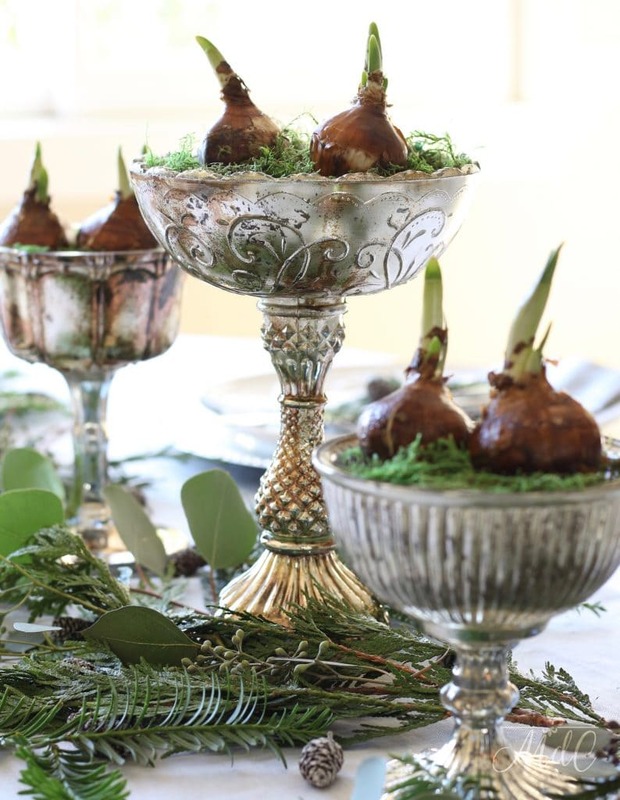 I used paperwhites in pedestal bowls, scattered pine and eucalyptus, and mercury candlesticks to create the focal point of the table. And I’ll let you in on a secret…. I’ve never grown paperwhites before! I’ve admired them for years, and once I had Pinterest I really fell in love with them. But still, I had never bought them or attempted to grow them until this year. I found these mercury glass pedestal bowls at a local boutique and I fell in love! And at the same store, they were selling the paperwhite bulbs, so that’s when I decided to take the plunge. I can’t wait for them to bloom all the way, but I actually love the look of them as they are. They’re elegant but natural at the same time. 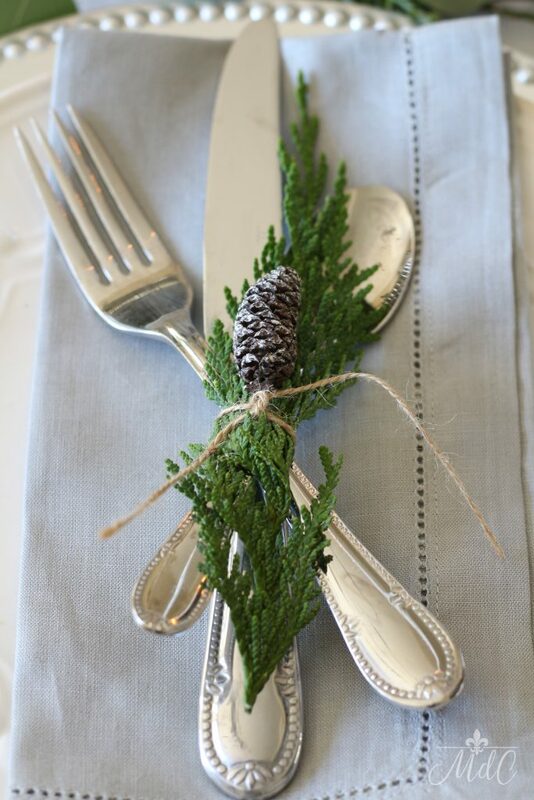 The greenery is cedar pine, regular pine, and both silver dollar and seeded eucalyptus. 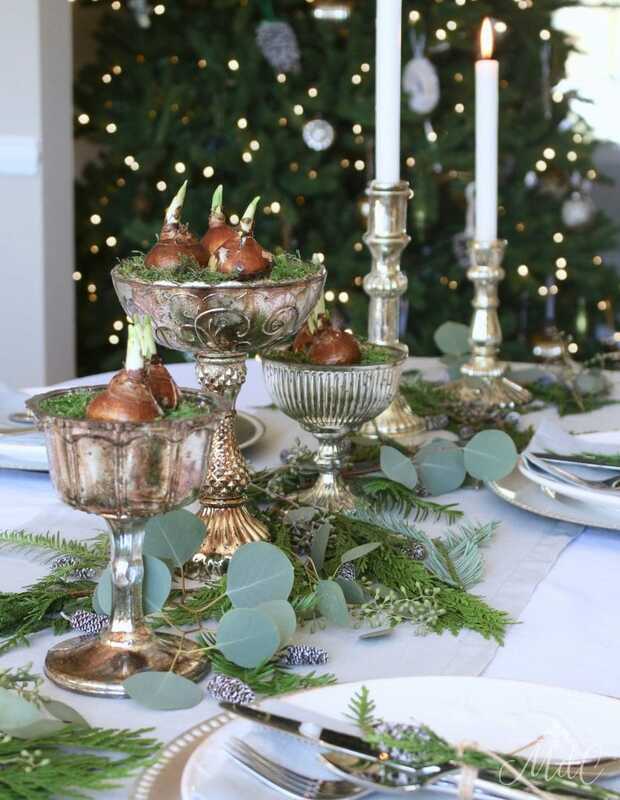 I also scattered some tiny frosted pinecones to complete the look. 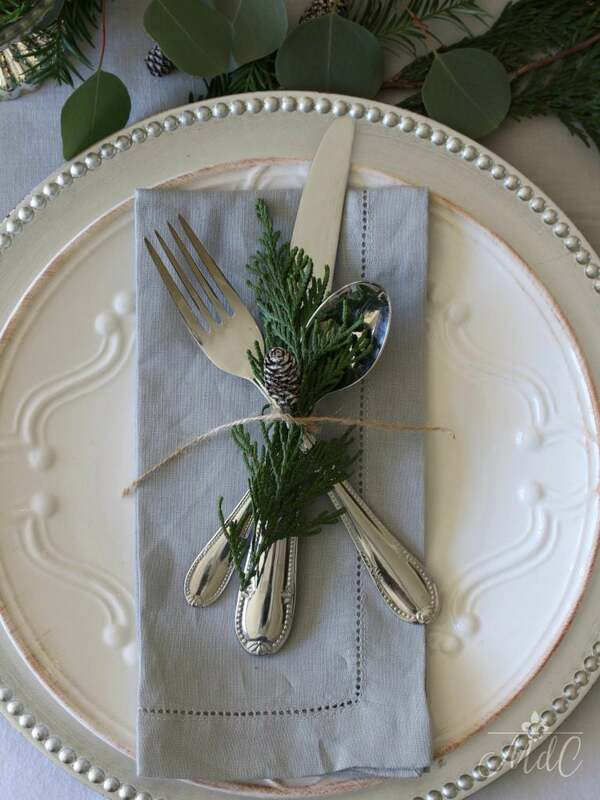 Grey linen napkins and silver chargers are both from Pottery Barn. I decided against napkin rings, and decided to use twine to tie together the flatware. I love that the twine is so casual and rustic against the mercury which looks “fancier.” One of the little pinecones finishes the look. 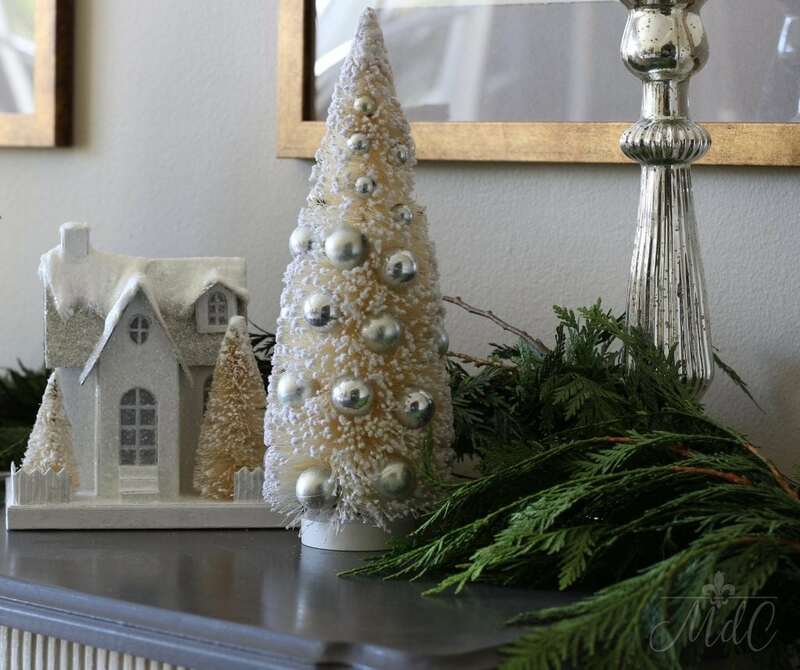 You can see more of these little white houses and bottle brush trees by visiting my French Country Christmas Home Tour. The paperwhites were not only easy to grow, but they’ve grown so quickly. I actually think they’ll be blooming by Christmas! 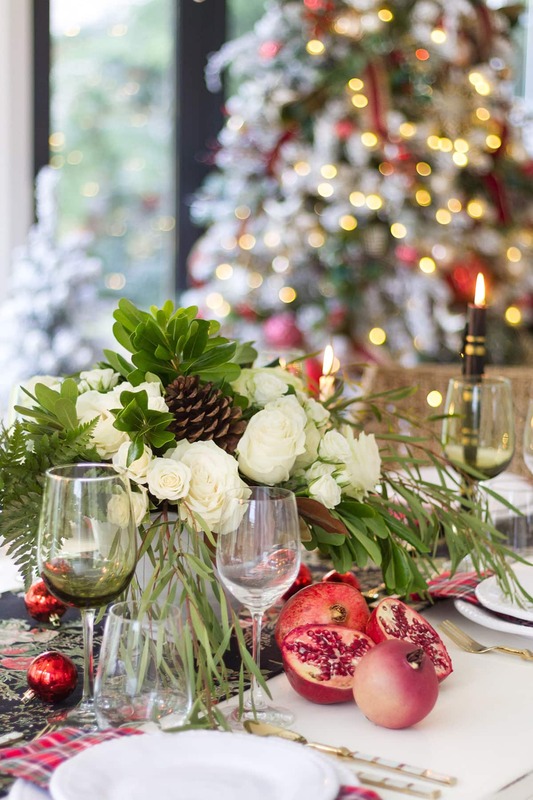 I hope you enjoyed my Christmas tablescape! 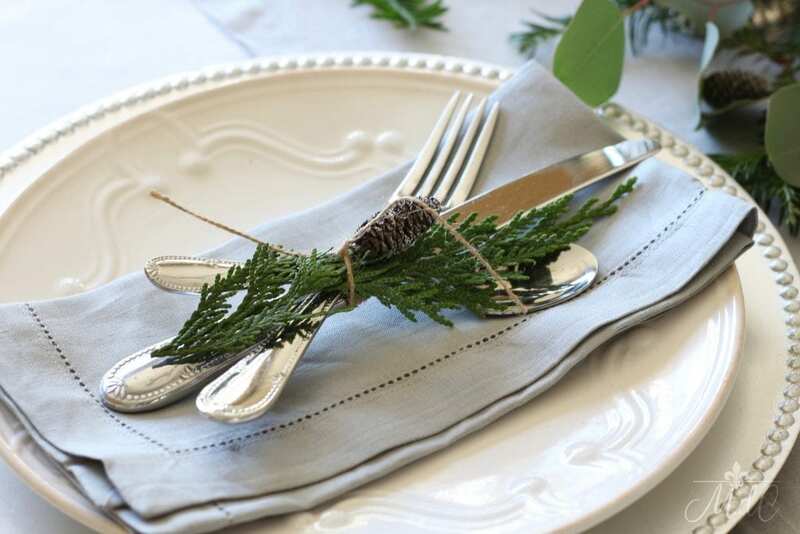 For lots more table setting inspiration (twelve actually!) 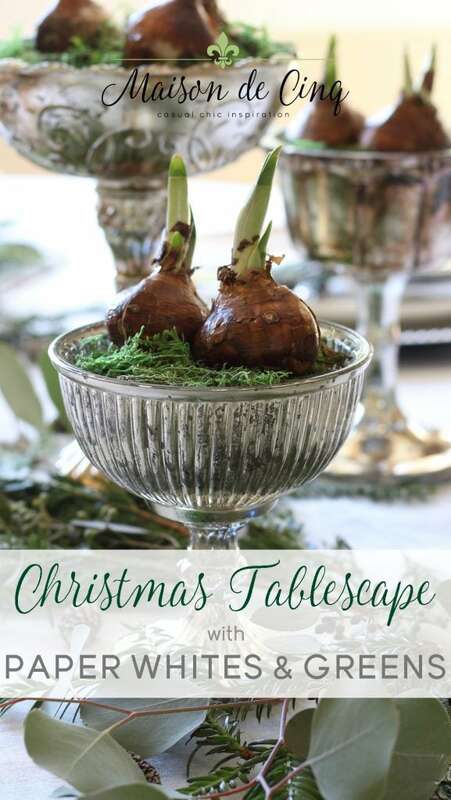 sign up for my emails and get my free e-book, A Calendar of Tablescapes! It’s so gorgeous, Sheila. 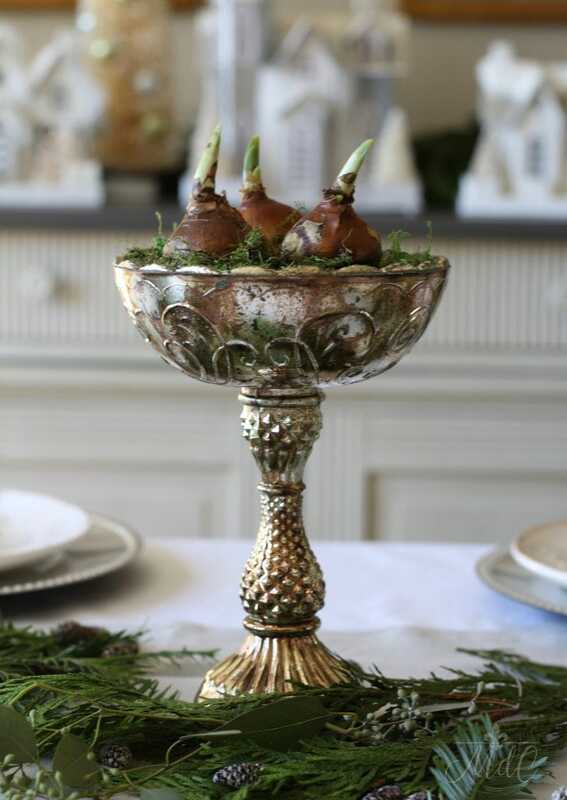 Love the paperwhites and mercury glass. Aww thanks so much Jamie! 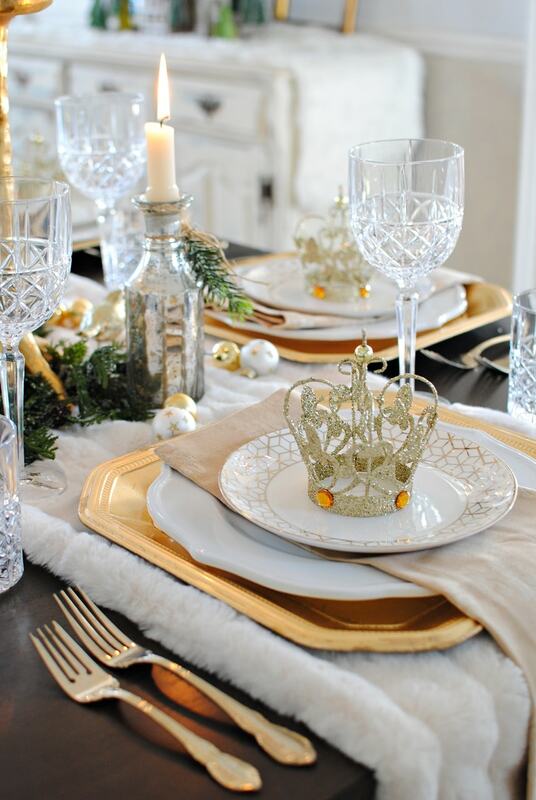 I always love your tables, and get so much inspiration from your gorgeous styling! 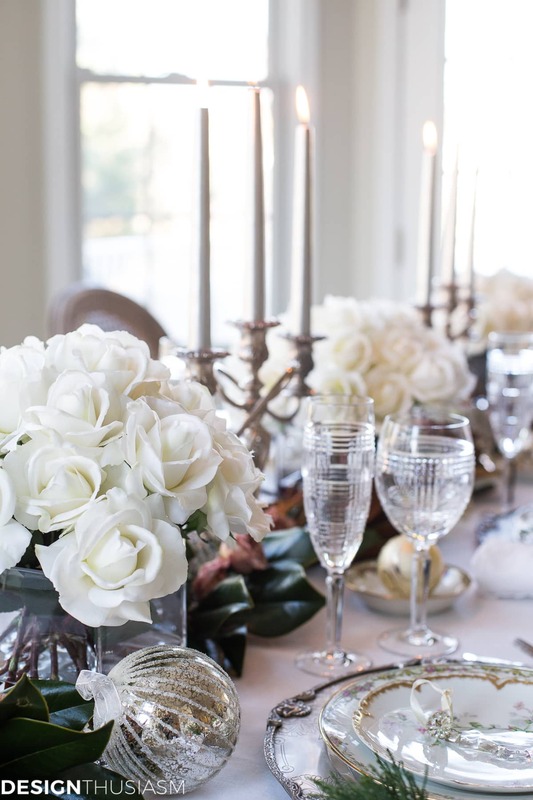 I love the simple elegance of your table! Very beautiful! Sheila, your table is so lovely. 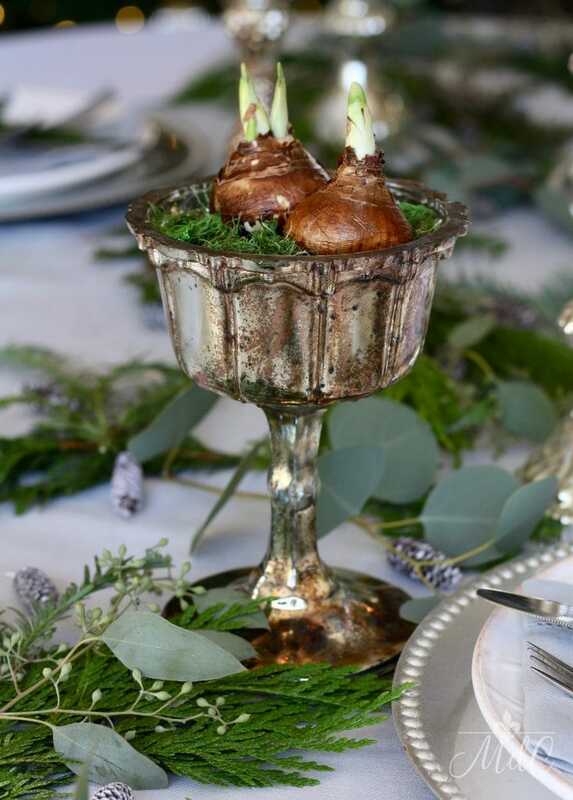 I love the mercury glass pedestal bowls. I planted some this year for the first time in years… and… they are already blooming. Like… they are going to be DONE by Christmas. 🙁 I didn’t know they grew so fast!! Thanks for linking up with Thursday Favorite Things! Hi Angelina! And thanks for stopping by! My paperwhites are growing so quickly too! They’ll definitely be blooming by Christmas because they are 4 inches taller than these photos! Happy Holidays to you in your new beautiful home! This table is stunning! It has an old world elegance that is very comforting. The pedestal bowls were a great find and perfect for the table. Love the paperwhites! 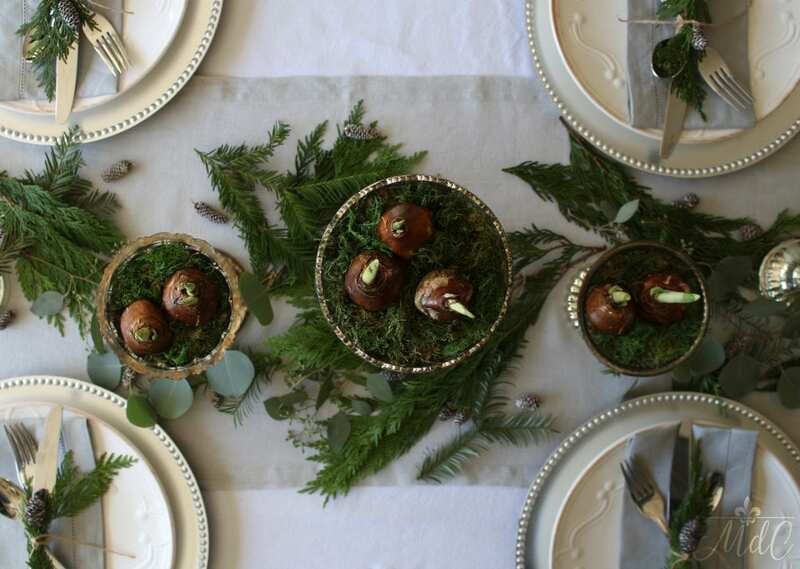 Hi Sheila, your tablescape is absolutely gorgeous! 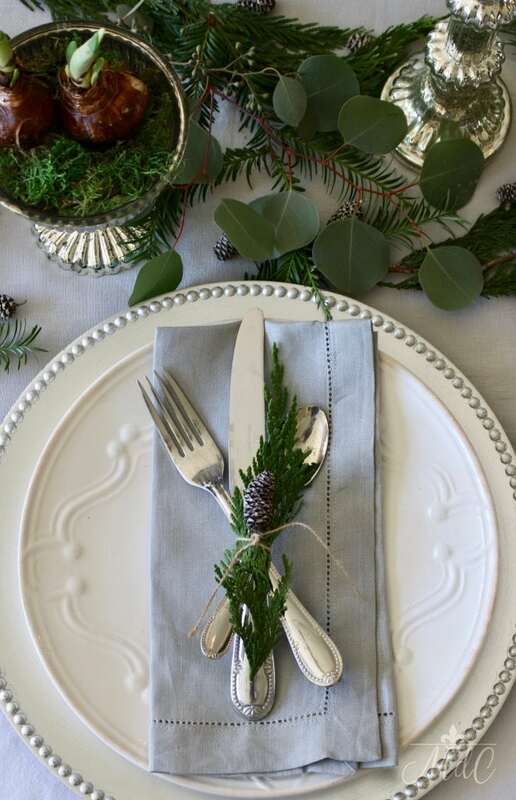 I love the combination of the silver chargers and the gray napkins. I adore growing paperwhite but haven’t gotten any this year. I usually buy them at a local garden center that interplants them with ivy. You will enjoy yours throughout the season, I’m sure. And thanks so much for your lovely comment! I’m so excited for my paperwhites and I don’t know why I didn’t do them sooner! I wish you could see them now – they are already about 4 inches high since I shot the table only a few days ago! Thanks so much for stopping by and Happy Holidays to you! 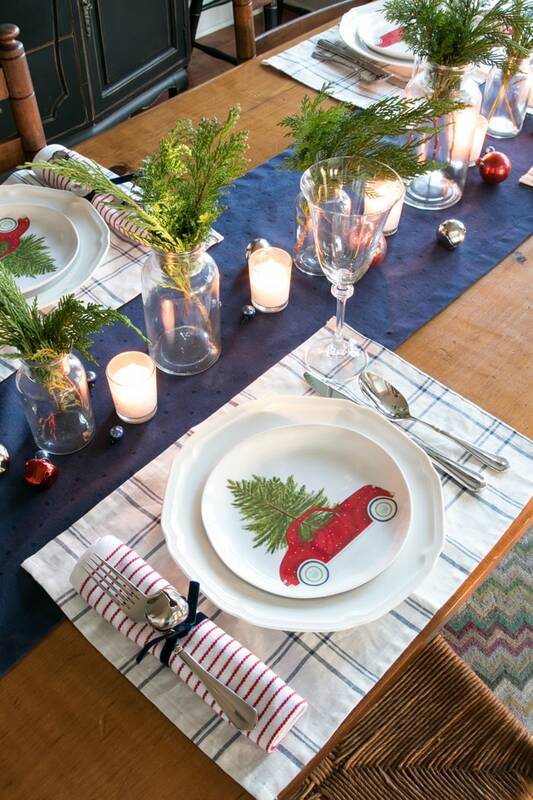 One of the most unique holiday tables I’ve seen…. 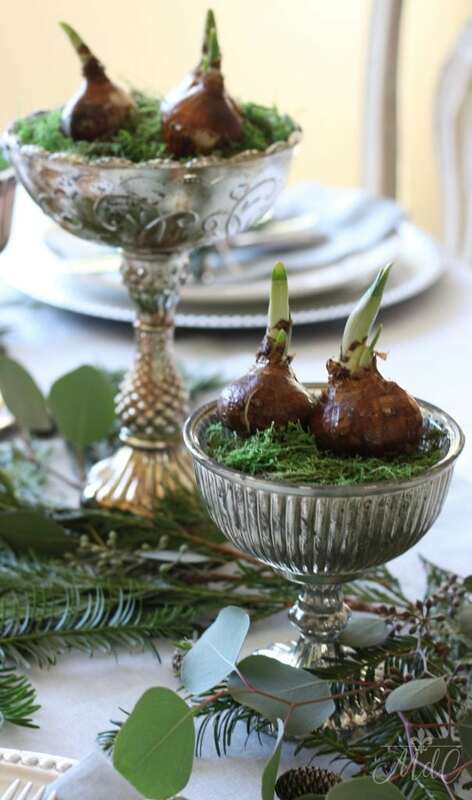 your paperwhites are so lovely…elegant and natural. And when they bloom, the fragrance is profound. Beautiful! I’ve never grown them before and I’m just in awe of how easy it was – and I can’t WAIT to see the blooms and smell the scent! Thank you so much for your comment and for taking the time to write!